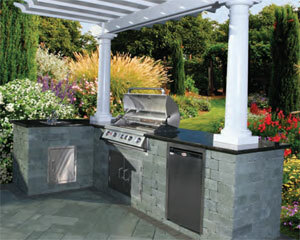 Complete with all the components needed for construction, Cambridge Outdoor Kitchen Kits are available in many different block and finishing styles. Some custom options are also available. The Cambridge Kitchen Kits come standard with a high quality Stainless Steel appliances made in the USA. Two different granite countertop colors are available. There are kitchen kits that require no cutting at all, as well as fully assembled units. Contact us today to discuss the kitchen options! "They have so many displays! The staff was great. Dave the gentlemen that helped me, was very informative and friendly." "Granville Stone and Hearth is always a pleasure to work with! I know that I can always count on their expertise." "Largest stone and hardscape yard i've ever seen on east coast. Very knowledgable staff." "Very pleased with the service & craftsmanship, thank you!" "Friendly staff who know their stuff! Very helpful & big on service!" "A leader in supplying quality stone products, paving stones and outdoor materials. Knowledgable staff and competitive pricing." "The absolute best selection, not to mention customer service. I highly recommend Granville!" If you can describe it, we can find it.